Mycobacterium leprae, the presumptive causative organism of leprosy, has a reservoir in patients afflicted with paucibacillary and multibacillary leprosy. Although its precise mode of transmission is only speculative, transmission through prolonged and intimate skin-to-skin contact with an infected patient and by the respiratory route have been traditionally incriminated. In view of the long incubation period of the disease, it may be hard to elucidate clearly the portal of entry. In addition, inoculation of the organism through a tattooing needle has been documented time and time again (1-5), indicating that the infection may occur through injury and puncture wounds. This aspect may not be significant as far as the transmission of the disease in nature is concerned. Tattooing of the skin in females as well as in males is a popular custom in countries where leprosy is endemic. Invariably, those practicing the profession are ignorant about its hazards, and sterilization of the tattooing needle is the major casualty. Therefore, a tattooing needle may play a significant role in leprosy transmission in such areas. It is imperative to record such a situation to highlight this mode of transmission of the disease. This aspect compounds the situation with the increasing prevalence of HIV infection the world over (9). Furthermore, the reports of inoculation leprosy, with rare exception, tend to describe disease patterns conforming to pau-cibacillary groups having relatively good immunity. This tends to support the hypothesis that immunogenicity and subsequent development of either an effective or an ineffective (suppressor) response to mycobacterial infections, including M. leprae, depend largely upon the route of infection and the type/nature of antigen-presenting cells encountered (6-8). Case no. 1. PW, a 30-year-old woman, was apparently well 3 years ago when she noticed a change in the color (hypopigmen-tation) of her skin on and around a tattoo on her left forearm. The tattooing was done simultaneously on identical areas of the left and right forearms 10 years ago. Initially, the lesion was small and conformed only to the tattoo. In the course of 3 years it has increased to its present size, and she has not been able to appreciate any sensation over the patch. 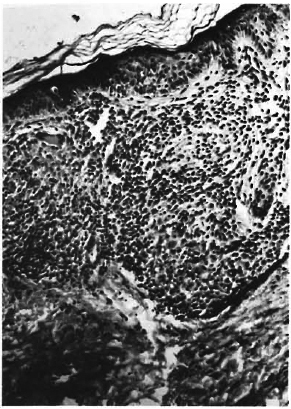 Examination of the left forearm revealed a well-defined, serrated, hypopigmented, uniformly indurated plaque. The induration was largely confined to the circumference of the lesion. There was loss of sweating, and temperature, touch, and pain sensations were impaired. The median and ulnar nerves were enlarged and tender. A slit-skin smear examination was negative. Microscopic examination of the hematox-ylin-eosin (H&E)-stained section was characterized by a well-formed granuloma comprised of plentiful lymphocytes, epithelioid cells, and a giant cell. Although the nerve was infiltrated, it was still possible to identify it. The granuloma was confined to the upper and mid-dermis (The Fig.). Acid-fast bacilli could not be identified using Fite's stain. The preceding clinical features were indicative of borderline tuberculoid (pau-cibacillary) leprosy. The Figure. A compact granuloma, showing plentiful lymphocytes and epithelioid cells along with an occasional giant cell located in the upper dermis (h&E x 200). Since then, the patient is being administered multidrug therapy consisting of 100 mg of diaminodiphenylsulfone orally daily and 600 mg of rifampin orally; the latter was given in daily dosages for the first 15 days and then changed to single monthly dosages. Case no. 2. TW, a 24-year-old woman, was well 6 months ago when a mild discoloration (hypopigmentation) of the skin just above the left ankle joint was noticed by her husband. It was confined to a tattoo. The tattooing had been done about 3 years ago. She did not experience any numbness or tingling over it. On examination, a well-defined, 2x2 cm, hypopigmented plaque with irregular margins was present on and around the tattoo. The plaque was dry and scaly, with mild erythema. It was located just above the left lateral malleolus. There was impairment of the sensations of temperature and touch. The proximal nerve was enlarged and tender. Histopathology was similar to Case no. 1. - V. N. Sehgal, M.D., F.N.A.Sc. 1. Lowe, J. and Chatterji, S. N. Scarification, tattooing, etc. in relation to leprous lesions of the skin. Lepr. India 11(1939)14-18. 2. Porrit, R. J. and Olsen, R. E. Two simultaneous cases of leprosy developing in tattoos. Am. J. Pathol. 23(1947)805-817. 3. Sehgal, V. N. Inoculation leprosy appearing after seven years of tattooing. Dermatológica 142(1971)58-61. 4. Sehgal, V. N. Upgrading borderline tuberculoid (subpolar tuberculoid) leprosy in tattoos. Int. J. Dermatol. 26(1987)332-333. 5. Sehgal, V. N. Inoculation leprosy, current status. Int. J. Dermatol. 27(1988)6-9. 6. Shroff, K. E., Sainis, K. B., Sengupta, S. R. and Kamat, R. S. Variation in immunogenicity of mycobacteria: role of antigen-presenting cells. Inl. J. Lepr. 58(1990)58-64. 7. Shroff, K. E., Sengupta, S. R. and Kamat, R. S. Route-related variation in immunogenicity of mycobacteria. Int. J. Lepr. 58(1990)44-49. 8. Shroff, K. E., Sengupta, S. R. and Kamat, R. S. Pathogenesis of route-related variation in T-sup-pressor response on immunization with mycobacteria. Int. J. Lepr. 58(1990)50-57. 9. World Health Organization. Guidelines for personnel involved in collection of skin smears in leprosy control programmes for prevention and control of possible infection with HIV. Geneva: World Health Organization, 1987. Present address for Dr. Sehgal: Director-Professor, Department of Dermatology & STD, Lady Hardinge Medical College & Associated Hospitals, New Delhi 110001, India.